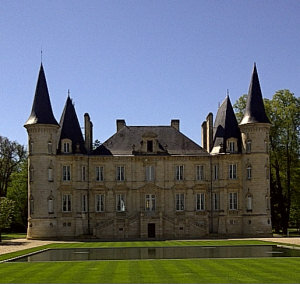 Following the hype and excitement of 2009, many involved in the Bordeaux wine trade were actually a little embarrassed that 2010 seemed to throw up another year where conditions were right to make great wines. Both were drought years (as was the excellent 2005), but as Paul Pontallier of Château Margaux told me, “The Médoc was not transformed into the Gobi desert, but technically the rainfall was at drought levels.” Interestingly however, this did not coincide with extreme heat as it did in 2003 and, to a certain extent in 2005 and 2009. 2010 was sunny but relatively cool all the way through the growing season. That meant the maturation of the grapes was delayed and the berries hung on the vine a little longer, but were also smaller than usual. Smaller berries means higher skin to juice ratio, so tannin levels were naturally high. Acidity was preserved because of the cool season, resulting in grapes that had good ripeness and potential alcohol, plenty of tannins and plenty of acidity. In short, all the components were there to make excellent, long-lived wines in 2010. Above: Château Pichon-Baron. Those favourable conditions did not result in universally excellent wines. Generalisations about left bank vs right, or how some communes performed compared to others, are next to meaningless in 2010. As is so often the case, the key to success lies in the attention to detail shown by individual estates and, in particular, how well tannins were managed. That is complex equation, part determined by factors outside the winemaker’s control – vineyard site, age of vines, mix of grape varieties – but greatly influenced by decisions taken in the vineyard and in the winery. It appears it was all too easy to ‘over-extract’, drawing too much tannin and inky pigment from the grapes in 2010. If the fruit is insufficient to stand up to the onslaught, the results can be pretty charmless and overly chewy. However some estates managed their tannins beautifully, so that they are much riper, more fine and less brutish than in less successful cases. And yet others managed to match fruit levels to big tannins producing large-scaled, but impressive wines. Alcohol is high in this vintage, particularly on the Right Bank, where 15% ABV and up is not uncommon. There are some 2010 Bordeaux that seem more like Coonawarra Cabernet in sweetness, tannins and oaky overdrive this year, yet the best have produced gorgeous wines where the fruit definition and finesse is supported by, not dominated by, tannin and oak. 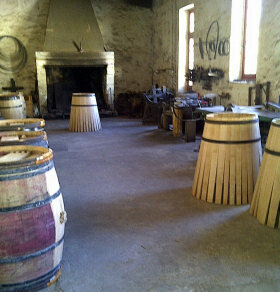 Above, the tonnellerie, or cooperage, at Château Margaux. My tasting notes follow. As always, these come with the caveat that these are unfinished wines that will spend another year or more in barrel before final blending and bottling. Because of that, it would make sense to mentally bracket all scores by one point either side – so you might like to think of my score of 90 as being a wine in the 89-point to 91-point range. Gorgeous nose, and effortless charm here too, with cherry and sweet red fruits, a touch of mineral gentle smokiness and very, very refined tannins. Long and pure in the finish, this is seductive and intelligent. 91-92/100. Only two 2010 Sauternes tasted, but what a showing for these wines.